Welcome, Silver Bells is a family run wholesale Christmas tree farm high in the foothills of Oregon's Cascade mountain range. Our mission is to provide our customers with unparalleled quality, personalized service and above all honesty and integrity. We strive to further the real Christmas tree industry through leadership, ingenuity and environmental stewardship. Over a century of genetic improvement has resulted in our unique Silver Bells Blue™ Noble Fir Brand. Native to the Caucasus Mountains in the former Soviet Republic of Georgia they are the latest trend in exotic trees. 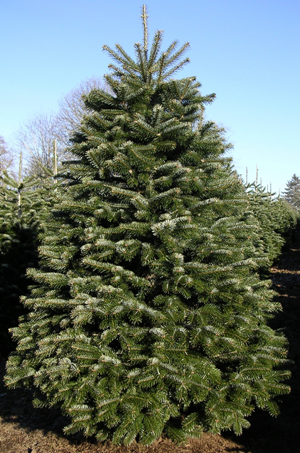 Silver Bells Blue™ Noble Fir Christmas trees are produced exclusively from Danish Frijsenborg Blue™ Noble Fir seed. Over a hundred years ago, Danish horticulturists collected Noble Fir seed from the temperate high elevations of the Pacific Northwest. This is the only place on earth where beautiful Noble Fir occur naturally. This seed was planted on the Frijsenborg estate in Denmark. Over the years, the Danes grew multiple seed orchards and sorted out trees with strong genetic characteristics. Some of the things the Danes selected for were blue color, excellent needle retention, distinctive upright branching and its beautiful “layered” look. Seed from the initial orchard was used to create a second orchard that, again, had undesirable trees removed. Superior seed from the second orchard grew the third generation seed orchard that also was “selected” for superior trees. Seed from the superior trees in this third generation Danish orchard is used to produce Silver Bells Blue™ Noble Fir. Silver Bells now has a fourth generation seed orchard growing on its farm in Oregon.